WHEN EVEN YOUR KEURIG HAS A MONDAY!!! Last Monday, my Keurig says THAT to me...I was like, NUH, UH?!?! I could NOT BELIEVE IT!!!! TALK ABOUT AN ATTITUDE!!! Liiiiiiiike, Ruuuuuuude!!! 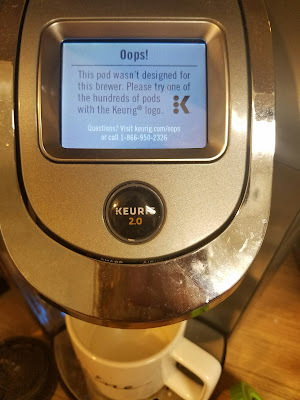 My keurig did NOT just say that to me!!! I even sensed some sarcasm from it!!! I was like, MAYBE my KEURIG NEEDS SOME CAFFEINE!!! Heh, heh!!! HOPE YOU GUYS HAVE A HAPPY MONDAY, GET YOUR CAFFEINE ON, ANNNNNNNND IF YOUR COFFEE MAKER GIVES YOU AN ATTITUDE, MAYBE IT NEEDS SOME COFFEE...HEH, heh!! !